Industries and retailers are causing a lot of confusion by referring to compact fluorescent light bulbs (CFLs) as ‘low energy light bulbs’. This creates confusion as there are other types of low energy light bulbs, like LED (light emitting diode) bulbs, which are becoming more commonly used in households, as well as a wide range of energy efficient indoor & outdoor lighting systems. Even worse is the fact that some relatively inefficient lighting systems, like traditional incandescent and halogen, are available as ‘low-energy’ systems, but are hardly as energy efficient or long-lasting as compact fluorescents. It is also worth mentioning that in other English-speaking countries, CFLs are simply referred to by their proper name. Another suitable name for CFLs is ‘long-life light bulbs’. CFLs typically, though not all the time, last for about 8 to 10 years – having a minimum life of 6 years (6,000 hours with average use) and up to 15 years (15,000). Because they last for a long time, CFLs are convenient and save a lot of time, not to mention the trouble of shopping, ladders and chairs. As such, low energy light bulbs last longer than lots of cars, televisions and washing machines. There are some light bulbs that have only a 3-year (3,000 hour) life. These are not ideal, except maybe for use in rooms that require a low level of use. Compact fluorescent light bulbs tend to be a lot more energy efficient as they do not produce excess waste heat. They consume only one-fifth of the electricity, which means that they are 400 percent more efficient. There probably isn’t another way you can save and improve on energy efficiency to this extent. Shades and light fittings will last for longer due to the significantly smaller amount of heat they produce. CFLs come in different ‘colour temperatures’, expressed as degrees Kelvin (K). Higher temperatures result in whiter light, while cooler temperatures result in yellower light. People have different tastes about the colour temperature. Some think that yellowish colours tend to be warmer and welcoming, while others don’t like it. There are some low-energy bulbs that have a ‘daylight-balanced’ colour temperature, which is believed to be helpful for people who are affected by a lack of daylight during winter (seasonally affected disorder). Why is recycling CFLs and other fluorescent light bulbs important? 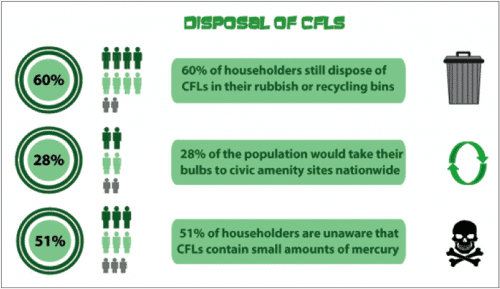 CFLs save energy and help decrease carbon emissions, however irresponsibly disposing them can cause harm to the environment. CFLs or other types of fluorescent light bulbs that are disposed of in the trash are typically sent to a landfill or are incinerated. These methods of disposal result in elemental mercury being released into the environment due to being broken or leakage. Exposure to mercury can also occur due to broken fluorescent light bulbs that are thrown out in a trash can, dumpster or trash compactor. Around 670 million fluorescent light bulbs are disposed of in the US annually. These can potentially result in about 2 to 4 tons of elemental mercury being released into the environment each year. Mercury can get converted into an organic form in the environment, which can then increase in living organisms and harm the food chain. To protect the environment and prevent the damaging effects of mercury, fluorescent light bulbs should be delivered to a recycler before they get broken. Recyclers are able to recover the mercury and other parts of these bulbs for them to be reused.